Disc Golf Etiquette - A must read! | Millennium Games | Over 1,000 Games! Disc Golf Etiquette – A must read! 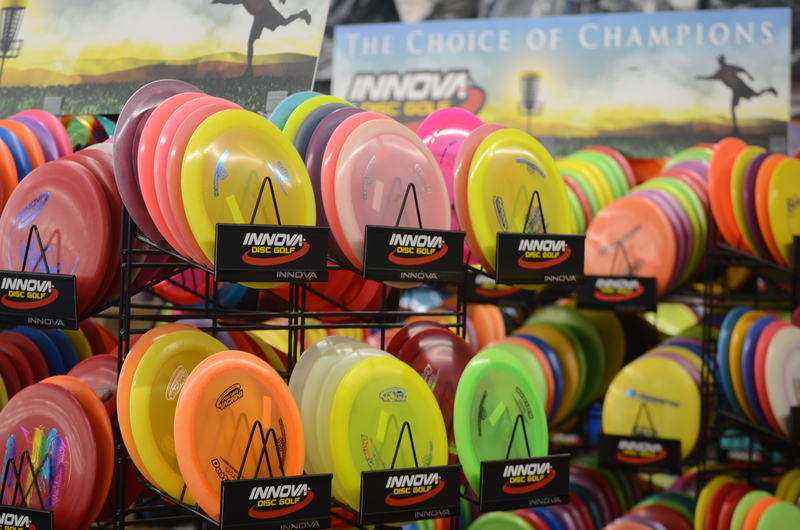 Many of our customers who are playing have not had a lot of experience with course games like disc golf, regular golf, and more. Here are a few ideas on how to make the playing experience better for both you and the other people around you. For the fun of everyone around you, take a read and try your best to follow the ideas posted here. Disc golf is meant to be a relaxing, enjoyable experience, and Millennium Games wants to promote that idea as best we can. Some of these tips will even help lower your scores by releasing stresses that may arise. We want everyone to have a better time while on the course, while allowing others using the course to enjoy it as well. If you notice that a group behind you is waiting for your group, offer to let them play through. Some players, especially alone, are trying to play a quick round, so try to let them play at the pace they desire when possible. Groups should be no larger than five players. If you must play in a herd, be very sensitive to smaller groups behind you and go out of your way to offer to let them play through. If you notice a player on a nearby hole getting ready to throw or putt, and see that you are in their sight-line, stop moving and talking until they release their disc. If possible, try to grant the requests of other players, however ridiculous they may seem to you (like “don’t talk to my disc” or “don’t stand directly behind me-even if you’re 15feet away”. It’s always easier to just take the high road and let it go. One big difference between ball and disc golf is the fact that it is common for disc golfers to start on a hole other than Hole #1. This is okay, but if you do ‘jump on’ in the middle of the course, take notice of the groups on the preceding hole(s). It is bad form to start on, say, hole 7 if there is a group putting out on hole 6. That group will suddenly have to wait behind a group that just jumped on. If you do ‘jump on’ in the middle of the course, try to find a spot where you don’t interrupt another group’s flow. If you feel compelled to share etiquette or game play tips with others, make sure to pick your words and tone carefully. Most players are not ‘rude’ on purpose, but out of blissful ignorance. They don’t consciously plan to aggravate you. And they may be disc golfing for the first or second time ever, so try to enlighten them with a smile rather than scold them with a scowl. If you see an errant disc disappear into the rough near you, from another hole, take the time to give the unfortunate thrower an idea of where to look for her/his disc. If you find an abandoned disc, attempt to reunite it with its owner. Ask the groups ahead of you if they left a disc behind, then either turn it in to Lost & Found or call the phone number on the bottom. Many people will write their phone number on the bottom of a disc, if they left a number give them a call. If you do not have a good place to meet the person once you contact them, you can feel free to leave the disc at Millennium Games and we will hold onto it until they can pick it up. Local Disc Golf parks are carry in, carry out – please remove any of your trash, including cigarette butts, from the park. Also scoop up and remove your doggie’s doo. Speaking of dogs, dogs are allowed at most courses, but dogs should either be trained, or kept on a leash – they tend to chase after discs. Don’t bring a dog on the course at all if he/she is likely to bark uncontrollably or chase random discs. Layout of Ellison Park Course – If you get lost looking for the next hole, feel free to ask someone around you for help, as it will speed up your round and theirs. Figure out what etiquette will happen when players are throwing. Some people won’t care if you are moving or talking, others need it a little quieter to focus. It can be helpful to stop moving and talk quieter when another player reaches their next shot. He/she may not seem ready to throw, but everyone has their own pace and focus strategy, so this lets them focus on their shot when it’s their turn. Stay perceptively behind the disc of whoever is the player whose disc is furthest from the hole. This one may seem obvious, but is also easy to violate as you move towards your own shot. If you are in front of a thrower, they may get distracted and throw an errant shot, which can lead to you being hit on accident. Everyone is out to enjoy themselves, but sometimes the noise can get rambunctious. Try to keep the volume down, especially when there are lots of other players on the course (Someone is probably preparing a shot). It is okay to get excited about a great putt or drive, but keep it in perspective. If your shot is starting to veer towards another player, yell! Calling out “HEADS UP” or “FORE” will make others look around for an errant throw. Even if it doesn’t come close, better to warn them than hit them. With that, get out to the courses and have fun! The important part is that you get some exercise, enjoy yourself with your friends, and meet some new people. And of course, if you have any questions feel free to call Millennium Games at 585-427-2190 or send us a message on Facebook.